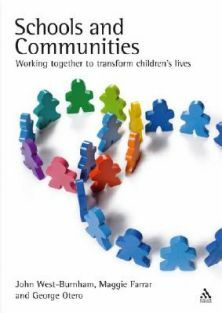 The title of this post comes from a book titled “Schools and Communities: working together to transform children live’s” by West-Burnham, Farrar and Otero. 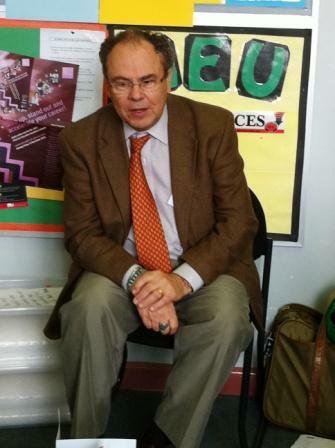 Pictured above is George Otero, a co author of the book and Co-President of the Relational Learning Centre in Santa Fe New Mexico USA. George has started to do some work with us here at Elsternwick Primary School on learning as a social process. I think the point being made here is that we need to learn from wider communities, organisations and networks so that we can benefit at these three levels in our own schools – classrooms, school and our communities. My work in Instructional Rounds comes into my mind here as I learn to observe instruction across schools in the network and bring these understandings to my work at Elsternwick Primary. George and his co-authors say, as do many other educators, the ‘one size fits all’ methodology of schooling has served its purpose and improvements are now plateauing. They point out a new moral imperative hidden in the plateauing of results “the widening variation in student achievement explained by student background.” Four social background factors are identified that influence the level of student academic success: low social class of family, low social capital of community, poverty and dysfunctional family life. They argue that schools need to work with the community on a broader definition of education that benefits both the individual student and the wider community. By broadening the definition of education and therefore our work in schools we can bring greater social equity to our actions to redress those social background factors that currently explain this variation in student success. So what does this mean at the classroom and school level? Essentially I think that George is arguing for us as classroom educators to form new levels of relationships with students and the students to have new relationships with the curriculum content so that student learning improves and the variance based on social background is diminshed. Recognition: content explained through lecture or download. Content is usually of little value for its rarely applied to anything and the learner has obtained facts to forget. This is in my opinion what is usually tested in high stakes testing like NAPLAN here in Australia. Understanding: content is tested through application to problems and interrelationships to other wider concepts and is sensed as relevant and of potential value to our lives. Valuing: here content acquired through the first two levels of recognition and understanding are now tested to discern their value to us personally and our worlds. Here we begin see the connections to other human beings as we integrate this learning into our own lives. Learners start to self govern as they decide what really matters. Relating: At this level learners are looking at new options as they apply learning making beneficial choices for themselves and others. At this level everyone’s experiences are equally shared with others in meaningful ways. I heard Jerry Starratt from Boston College express a similar thought about the purpose of education saying that “education was about gaining membership to the various communities we live in”. When you have learning at the valuing and relating levels I think you are recognising what’s required for this membership to the various communities we seek to live in. students relationships to the wider community: e.g. Inquiry learning, SRC. Much of this is not new to us – but I think there are challenges in this new lense. I’m currently grappling with an assessment system that values high stakes testing which see content largely as facts to be recalled. This recognition level with its value system is then applied to the work of teachers in classrooms. Teachers are valued and in some places around the world, including here in Australia, starting to be paid on their capacity to improve results based on the recall of facts on tests. Wider groups e.g. governments publish test results based largely on recalling facts and encourage parents to expect, even demand, ever increasing results on these tests. This is largely about the student as an individual and is certainly not about learning at the understanding, valuing and relating levels or phases. Why would teachers waste time conducting circle time with students to improve relationships with other students and teachers if learning was not seen as relational but largely as an individual process where one acquires facts and success is measured through the recall of them on tests. Conversations in ‘Circle Time’ between teacher and students are not the usual instructional focused ones that dominate most classrooms particularily those classrooms where the recall of facts is valued above other levels of relationship. These circle time discovery conversations where we open our thoughts to others and mutual growth is an end result are at the valuing and relational end. I’m often of late in the middle of some confusions conversations from what I now perceive as coming from differing value systems. I’m busy trying to put some sense to all this through a pedagogical plan that has a dream for all students at its core and a kind of map of how we go about designing the journey for them all. I’m happy to share that plan on a future post but for now I’m intrigued if others sense a similar confusion about how students get to understand value and then relate learning concepts to their own lives and lives of others around them . Do you grapple with the inconsistencies of say assessment systems that value different things? I think I’m in Nottinghams Learning Pit on this one. Next Next post: For those who have had some trouble getting technology to work.